Look, we warned you. Proceed at your own risk. This is the sort of “dumb” that will make you LOL. 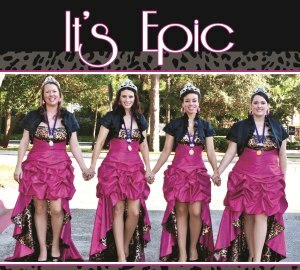 So, once upon a time, there was a quartet named Epic who liked to pick on their lead, Anne. She sort of deserves it. We were in Chicago for the Village Vocal Chords show. We enlisted a co-conspirator in the form of an innocent VVC hostess who was charged with simply delivering Epic to its hotel after the show. Unfortunately, Anne had no pajamas on that trip. Nobody in the quartet was going to sleep with her in her birthday suit, so we asked our poor hostess to take us to the local Target store. Step 1: Anne goes into Target. Step 2: We move the car. Step 3: Anne comes out of Target. By the way, just be lucky we didn’t record the pajamas she bought on that fateful night. Ask her about it the next time you see her at IC&C. Is this your way of telling us all that there will soon be an Epic set, in pajamas? Perhaps Epic Mad Women?